Months of bear pressure took a toll on several development arms as well as Consensys. Consensys–chaired by Joseph Lubin, plans to slash staff thanks to the deep losses in ETH. Like TRX, ETH prices tanked by as much as 90 percent sliding from highs of around $1,400 to sub $100. According to reports by Verge, staff from around 36 startups incubated by Consensys will face the sack, and Justin Sun is pouncing on this opportunity. Coincidentally, this comes at the time when TRX performance is solid. It is up 58 percent in the last week replacing ADA and Cardano with a market cap of $1.33 billion. This means TRX is back to 10th in the liquidity list further boosting coin holders who had to contend with double-digit losses after peaking early this year. Tron continues to make strides. Aside from launching their blockchain, the platform is attracting quality developers as well as projects willing to reap benefits like speed, zero fees, and high throughput. After a 58 percent expansion in the last week, TRX is correcting and down 5.1 percent in the last day. The retracement was expected, and as long as prices are trading above 1.5 cents, bulls should be in charge. In line with our previous TRX/USD trade plans, every dip should be a buying opportunity and traders should look to buy ideally from around the 1.5 cents–1.7 cents more so if prices drop below today’s lows of 1.9 cents. On the reverse side, gains above 2.3 cents or today’s high would propel prices above 2.5 cents towards 3 cents and 4 cents. 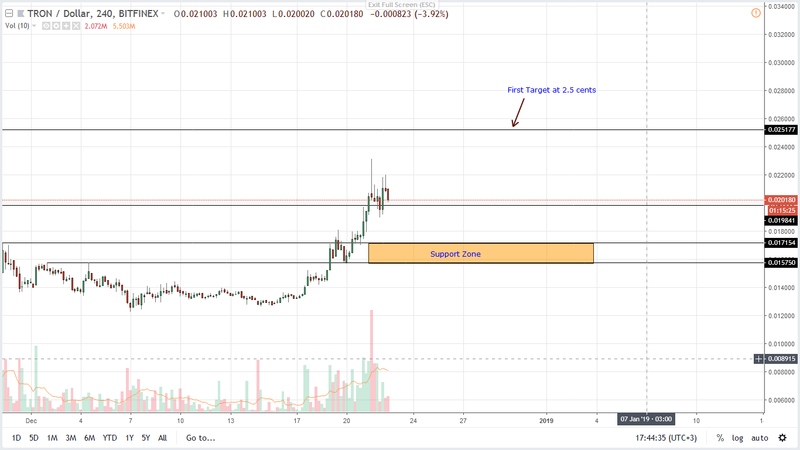 The post Tron Price Analysis: TRX Surge 58 Percent, Back to Top 10 appeared first on NewsBTC.